Thermography is the use of infrared cameras to map the surface heat of an object. Using heat to detect problems is a very ancient skill/art, but in the past the human hand was used to feel for problems. Today’s thermal imaging cameras are derived from military technology and are so sensitive they can detect differences in temperature of less than 0.05 degrees Celsius, which is vastly more sensitive than the human hand. 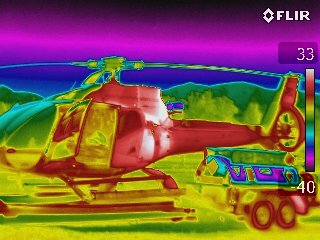 Thermography is used in many different arenas of human and animal health, public health and safety, building, industrial, electrical, sport, military, policing and research. 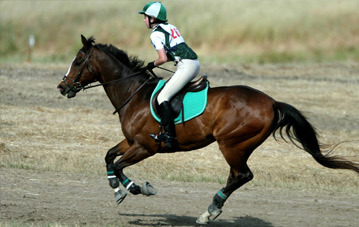 At Natural Mobility NZ we concentrate on three areas- Animal, Building and Industrial. 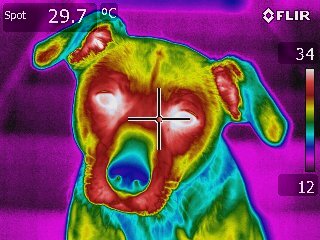 Using a high quality thermal imaging camera is non-invasive, almost silent, emits no radiation, is highly portable, doesn’t require sedation of the animal, allows some distance between the operator and subject, and provides images of excellent clarity that can be seen immediately. 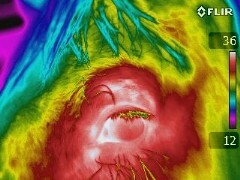 Thermal imaging cameras are well established in the UK and USA as diagnostic tools. 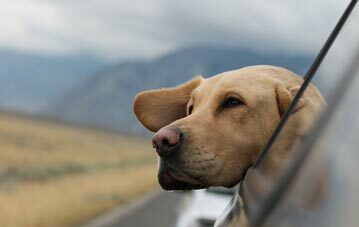 For animals (and humans) they identify any abnormal changes in temperature; either hotter areas that overlie an area of soreness and inflammation, or colder areas signifying nerve damage or blockages. 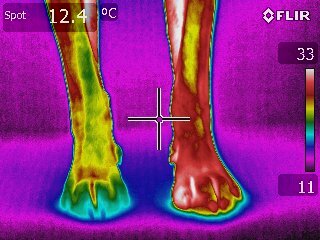 A mammal’s thermal pattern is usually symmetrical from one side to the other, making it relatively easy to spot injured areas. 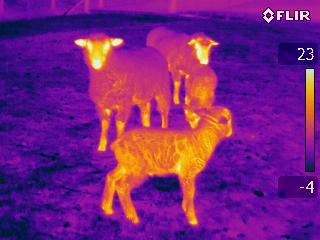 A small infrared camera is used to take images of the animal; the images are recorded and then digitally enhanced on a computer. The images are available quickly along with a report that can then be shared with other people involved with the animal’s care i.e. veterinary surgeon, acupuncturist or saddler, for instance. With respect to animals, it provides a mobile, leading-edge technological tool for diagnosis, prevention and monitoring of injury or illness. 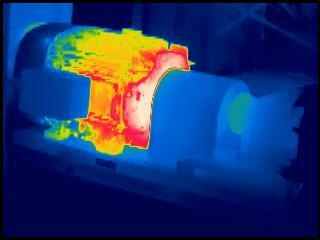 Thermography is one of the best methods to identify construction problems or failures in buildings. 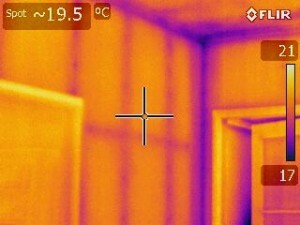 Scanning a building with an infrared camera allows slight variations in heat to be identified. Industry uses an enormous variety of machinery in production areas. Machines are subject to wear and tear issues and if they do break down can cause expensive repairs and loss of production. 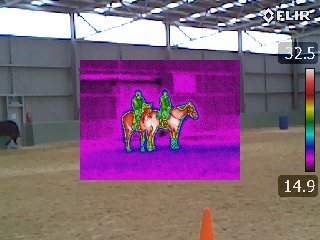 Most machines will heat up before failing and this is where thermal imaging is so useful. Increases in heat due to excessive/uneven wear, failing insulation/pipe work, uneven tracking, uneven cooling, heating or wetting etc can all be identified using thermal imaging. Often is it blindingly clear on a thermal image where there is a problem well before the machine breaks down, or problems in production are noted. Using thermal imaging as a predictive maintenance tool is an extremely cost effective way to avoid production breakdowns, and does not require the production to stop whilst being assessed! Thermal imaging provides a mobile, affordable, visual management tool in a wide variety of applications. 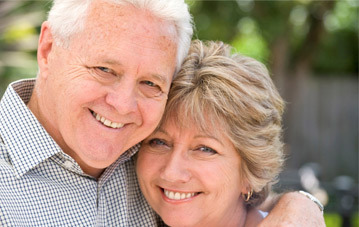 Click here to contact us and arrange a thermal imaging session. Sujon BlackcurrantA 100% natural super antioxidant product that improves cardiovascular performance, aids recovery & improves stamina.